TUESDAY, May 6, 2014 (HealthDay News) -- When an expectant mom regularly eats her meals in front of the TV, chances are she'll continue that habit during her baby's feedings, a new study shows. That's a concern because infants who watch mealtime TV likely become young children who watch TV while eating. And previous research suggests that youngsters who spend a lot of time in front of the TV, especially during mealtime, are at risk of becoming overweight or obese, the researchers noted. An immediate problem with mothers watching TV during feedings is that they might miss the subtle cues that indicate their baby is full, and end up overfeeding their babies, said study author Dr. Mary Jo Messito. She is an associate professor of clinical pediatrics at the New York University School of Medicine. Past studies involving preschool and school-aged children have shown that TV viewing during meals is linked to a poorer quality diet, a decreased sensitivity to feeling full and a greater consumption of calories. Of the women in her study who watched TV during mealtimes while pregnant, Messito said, "There was a five times more likely chance that she would be exposing her baby to TV while feeding." That could eventually lead to mealtime TV becoming a habit. The study authors noted that other research has shown that TV habits developed in childhood tend to continue into young adulthood. The research is scheduled to be presented Tuesday at the Pediatric Academic Societies annual meeting in Vancouver. Studies presented at medical meetings are typically viewed as preliminary until published in a peer-reviewed journal. Messito and her colleagues studied 189 women, asking how often they watched TV at mealtimes during their third trimester and then again about how often they watched TV while feeding their 3-month-old babies. The researchers only asked about TV use. They didn't include questions on computer, tablet or smart phone use. The women were all enrolled in the Starting Early project, a childhood obesity prevention intervention meant for low-income Hispanic families. All of the women started the study during pregnancy. The researchers followed up with the women until the children were 3. In all, 71 percent of the women reported at least some mealtime TV viewing during their pregnancy. A third said their 3-month-old infants were exposed to TV during their feedings. Women who were under age 25 were more likely to watch TV while feeding their babies than were older mothers. And women who didn't breast-feed exclusively were also more likely to turn on the TV while feeding their babies. That may be because it's more difficult to manage TV watching and breast-feeding than TV watching and bottle feeding, Messito said. The study didn't include data on dads' TV viewing and baby-feeding habits. However, Messito said she hopes to do research on dads' influence in the future. Messito also couldn't say if the TV viewing during mealtimes indicates the possibility of other unhealthy habits, such as low amounts of exercise. "We didn't look at that yet," she said, but added, "in general, usually excess TV viewing is associated with less physical activity." The study results don't surprise Dr. Dimitri Christakis, a professor of pediatrics at the University of Washington and director of the Center for Child Health, Behavior and Development at Seattle Children's Hospital Research Institute. "The more TV you watch, the more likely you are to do it in all circumstances," he said. 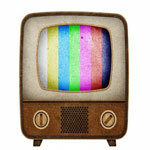 "To put the findings in perspective, we know that combining eating and TV viewing is bad. It's the primary way TV leads to increased obesity. We know that from other studies." About one in four households has the TV on during mealtimes, said Christakis, citing other research. Overeating while viewing is common. "It appears that the visual and cognitive distractions from television override the satiety reflex [indicating fullness]," he said. "It's a problem we have known about for some time." Messito offered some advice for expectant moms. "I try not to be dogmatic and say never [watch TV]," Messito said. However, keeping TV viewing under two hours a day during pregnancy would be wise, she said. The American Academy of Pediatrics recommends that children under age 2 avoid TV and other media. Children age two years and older should be limited to one or two hours daily of entertainment media (TV, computer games, and so on), the pediatric group recommends. While the study suggested an association between TV viewing habits and childhood obesity risk, it did not establish a cause-and-effect relationship.